Pasadena, CA – For the first half of this year’s winter, the big news was warm temperatures and lack of snow. Ski resorts were covered in bare dirt, while January temperatures in southern California topped July highs. This map shows temperature anomalies for Europe and western Russia from January 25th to February 1st, 2012, compared to temperatures for the same dates from 2001 to 2011. 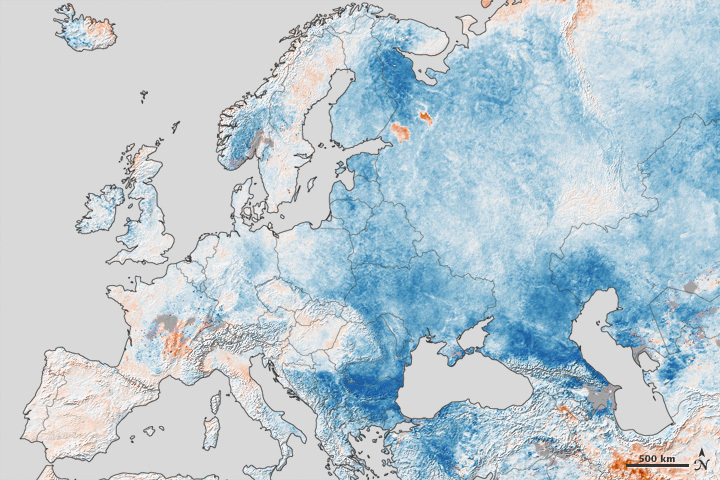 The anomalies are based on land surface temperatures observed by the MODIS instrument on NASA’s Terra satellite. However, even the breakdown of the vortex cannot completely account for the severity of the winter Europe is suddenly experiencing. As strange as it sounds, some climatologists, among them Judah Cohen of Atmospheric and Environmental Research in Massachusetts, attribute the unusual cold to global warming. Cohen contends that since sea ice is being melted by warmer temperatures in the Arctic, more moisture is available for the atmosphere to pick up – and drop as snow. As a result, Siberian snow cover has increased, and this snow cover has a cooling effect which reaches East Asia and Europe. There are many other examples2, and climate change can’t be blamed for all of them. 1To stress the complexity of the system, Tom Wagner, the Earth Science Division’s Cryosphere Program Manager at NASA headquarters, notes “a new paper out by Chang in the Journal of Climate that talks about impact of the Indian Ocean on North America: The warming of the Indian ocean from global warming in turn causes warming of central US. There more to the story than diminished ice cover. We’re dealing with a complex, interconnected system, and warming has unusual affects with teleconnections.” Complicating matters further, there are also larger cycles superimposed, but that’s another story. 1816 was the “Year Without a Summer” in the Northern Hemisphere. On July 4th that year in Savannah, Georgia, the high temperature was 46°F! There were food shortages due to crop failures and livestock deaths in the US, Canada, and Western Europe.